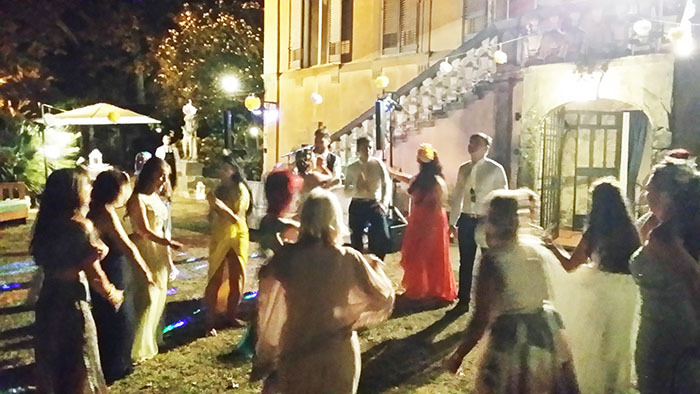 Another amazing wedding reception and party in Tuscany at Relais dell’Ussero, Villa di Corliano – Via Statale Abetone Rigoli 50, Loc Corliano, San Giuliano Terme, Pisa, Italy. Close to Pisa (10-15 mins), close to Lucca (20 mins) and Pisa International Airport (20mins), this historic villa is perfect if you want both get lost the Tuscan nature away from the city traffic and stay in the best placed hotel for anyone visiting this piece of heaven in Italy. A Villa di Corliano wedding. From the moment you get there, it is like going back in time to the fifteenth century, it’s just magical, and it takes you a way back in history. The newly-weds Leann and Ian from liverpool, UK, well-advised by their wedding planner Cinzia Sica, have decided to set the ceremony, aperitifs, dinner and party around different locations of the Villa: the ceremony in front of the “Kaffehause”, the aperitifs on the side garden, the dinner in the Frescoed Main Hall – where there are frescoes by Andrea Boscolo (1592) and Nicola Matraini (1750) – and the wedding party in front of the Villa; Guty & Simone “the Italian wedding musicians and DJs” provide the perfect soundtrack for the entire event: for the aperitifs they set up a sound system in the garden playing a playlist that gives to this moment an “Italian feeling” (based mostly on some Andrea Bocelli easy listening hits and some Italian and international classic songs); for the dinner a sound system in the Fresco Main Hall for some background music (a Spotify playlist made by the bride and groom) and a wireless microphone for the speeches; for the Wedding party they set up their main PA, instruments, DJ equipment and lights system in front of the VIlla for the live music & Dj set music and they fill the dance floor all the evening.